Thanks to Bec and Cheryl for inviting me to spend six months as guest on the team - I've really enjoyed the challenges! This challenge we want to see your Easter cards but you must use Green, Blue, Pink and Yellow on your card! 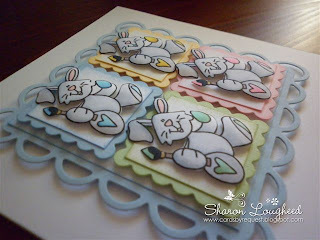 This challenge we have been sponsored by Bugaboo Stamps and image I've chosen to use an image called BUNNEGG - Paint Egg. 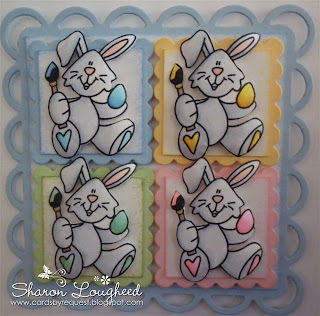 I thought this cute image would make a great card for a friends little Grandson Rylan for Easter. I've also opted to print four small digi images rather than one large image - which is really the beauty of using digi stamps - they are so versatile with sizing. I've gone for a clean and simple card with a large white border. 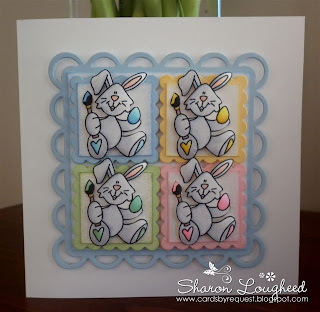 The center of my card contains four small nestabilities scalloped sqaures coloured in the colour of the challenge and each has an bunny image (coloured with copics to match) mounted in foam on top. These are all mounted on a piece of white cardstock and then placed on a larger nestabilites scalloped shape. I've use a lot of foam tape in between my layers for extra dimension. 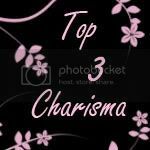 I did attempt to add a sentiment but it just didn't look right so I've decided not to use one. 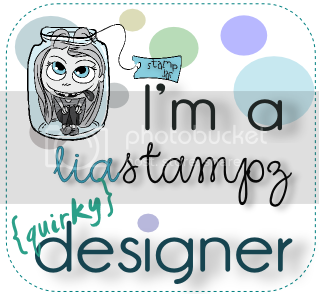 Thanks for stopping by and be sure to check out the wonderful creations by the rest of the DT over at Bizzy Becs Creatalicious Challenge and welcome the talented new DT Members. I hope I've inspired you to join in the challenge! Awwww how cute love your design too. Thanks for joining us at C.R.A.F.T this week with this adorable card. GDT for the month of April. Oh this is so adorable Betty, gorgeous card. What a gorgeous card Sharon. Oh this is soo cute! Thanks for joining us at CFM and good luck in the challenge! Absolutely GORGEOUS and such a fabulous LO,might have to case this some time!!! Thanks so much for all your wonderful creations and friendship at Creatalicious.......we wish you all the best!! Thanks for sharing it with us at Papertake Weekly. This is such a wonderful creation. Thank you so much for participating in the SFTW Easter challenge with it! You have really cute images. Wonderfuly and beautifully colored card. Pastels colors are so pretty. I love the 3D look. Love your layout. 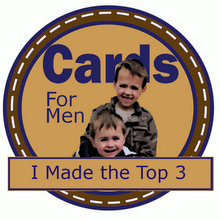 Thanks for joining us at Cards for Men. We love seeing your creations. Good luck on the challenge. such a delicious and cute card!